You enjoy a fine cigar. You enjoy a nice drink. How to you match the two? Are there some spirits that pair better with cigars and some cigars that pair better with spirits? These are two questions we hope to answer in the next couple of paragraphs. First, let’s start by agreeing that there are few things in life that please the palate like paring your favorite cigar with a matching libation. Cigars are often paired with the darker spirits like single malt whisky, bourbon, rum, rye and cognac. Usually cigars are not paired with white liquors like vodka and gin (although, we know several people that enjoy a mild cigar with a gin martini). However, white tequila is sometimes used as a good pairing. The reason for some spirits and not others is simple: with most white spirits, the cigar will overpower the drink. It is not good to have the cigar overpower the drink, or vice versa. For a good pairing, you want balance. You want to match the body of the cigar to the body of the drink. And most times, it is a matter of your individual taste. A good rule of thumb, is the lighter the drink, the lighter the cigar, and the more full-bodied the drink, the more full-bodied the cigar. For example, a medium-bodied cigar pairs well with Irish whisky, and a milder cigar with cognac. 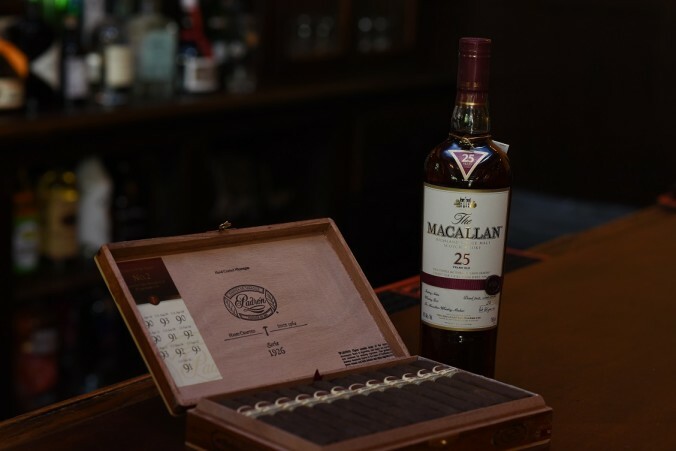 We often see people pair a power-house cigar with a single malt whisky. The secret is to let your palate be your guide, and enjoy. If you don’t drink, try other pairings. A good medium-bodied, somewhat spice cigar pairs well with Dr. Pepper, for example.